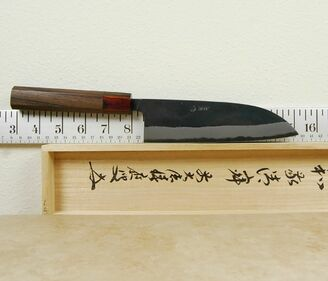 Yamashin knives are made in the ancient city of Tosa. Tosa is located in central Kōchi Prefecture, and faces the Shikoku Mountain Range to the north and Pacific Ocean to the south. Many blacksmiths from this region make kurouchi knives and the area is especially known for this type of finish. They also use hammer forge techniques in making their knives. 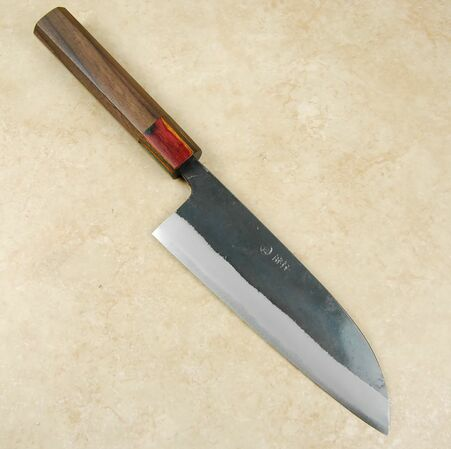 We stock two lines of knives from Yamashin. Both are kurouchi finished but each use different core steels. This santoku is made from Blue #2, or Aogami 2, high carbon steel. The main difference between this and the White variety is in the added chromium and tungsten elements. 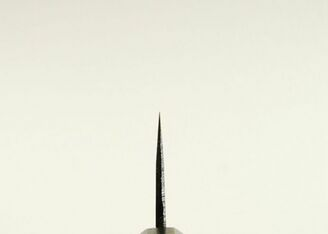 This increases the toughness and edge retention of the blade but it does make sharpening a bit more difficult. This hard center is then clad san-mai style with a softer iron layer (or jigane). The outer layer is then blackened with an oxide film while it is being hardened, which produces the rustic finish known as kurouchi. These knives are set with a 50/50 even grind. The santoku is a very versatile knife which is finding favor in more and more western homes and professional kitchens. Santoku translates as �three virtues� and the trio of cutting tasks this represents are slicing, dicing, and mincing. The knives are characterized by their sheep-foot-shaped blade and shorter length. 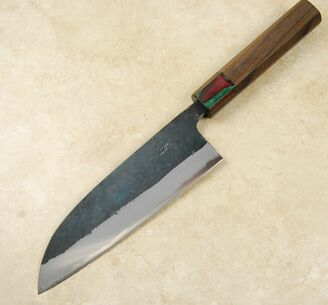 It can best be described as a short chef knife or gyuto with a bit more height.